Sir Giles Sebright, Beechwood, Boxmoor and London; (sale, Christie, Manson & Woods, London, 2 July 1937, no. 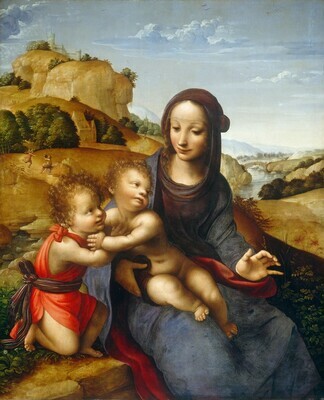 110, as by Leonardo da Vinci); sold to (Giuseppe Bellesi, London) for (Count Alessandro Contini-Bonacossi, Florence); purchased 1938 by the Samuel H. Kress Foundation, New York; gift 1939 to NGA. Reported as having been cradled, cleaned, and restored by Stephen Pichetto in 1938/1939, the picture is in very good condition, with losses confined mainly to the top and bottom edges of the original panel. A small triangular inset fills the lower right corner. Some unevenness in the paint along the left edge is due to wood knots. The red underpaint of the Madonna's blue robe was evidently meant to show through, as the surface is scored. The artist appears to have used a mixed medium, perhaps alternating tempera and oil layers. Preliminary Catalogue of Paintings and Sculpture. National Gallery of Art, Washington, 1941: 186, no. 416, as by Sodoma. Book of Illustrations. National Gallery of Art, Washington, 1942: 248, repro. 190, as by Sodoma. Paintings and Sculpture from the Kress Collection. National Gallery of Art, Washington, 1945 (reprinted 1947, 1949): 115, repro., as by Sodoma. Paintings and Sculpture from the Samuel H. Kress Collection. National Gallery of Art, Washington, 1959: 86, repro., as by Sodoma. Summary Catalogue of European Paintings and Sculpture. National Gallery of Art, Washington, 1965: 124, as by Sodoma. Berenson, Bernard. Italian Pictures of the Renaissance: Central Italian and North Italian Schools. 3 vols. London, 1968: 1:409. European Paintings and Sculpture, Illustrations. National Gallery of Art, Washington, 1968: 110, repro., as by Sodoma. Shapley, Fern Rusk. Paintings from the Samuel H. Kress Collection: Italian Schools, XV-XVI Century. London, 1968: 144, fig. 354. Fredericksen, Burton B., and Federico Zeri. Census of Pre-Nineteenth Century Italian Paintings in North American Public Collections. Cambridge, Mass., 1972: 189, 337, 646. European Paintings: An Illustrated Summary Catalogue. National Gallery of Art, Washington, 1975: 330, repro., as by Sodoma. Hayum, Andrée. Giovanni Antonio Bazzi - "Il Sodoma". New York and London, 1976: 276. Shapley, Fern Rusk. Catalogue of the Italian Paintings. 2 vols. National Gallery of Art, Washington, 1979: I:184-185, II:pl. 128, 128A, as FLorentine School. Trutty-Coohill, P. "Studies in the School of Leonardo da Vinci: Paintings in Public Collections in the U.S. with a Chronology of the Activity of Leonardo ... and a Catalogue ...." Ph.D. dissertation, Pennsylvania State University, University Park, 1982: 279-285. Leonardo e il Leonardismo a Napoli e a Roma. Exh. cat. Palazzo Barberini, Rome. Florence, 1983: 65, fig. 60. Dalli Regoli, Gigetta. La preveggenza della vergine. Pisa, 1984: 12, 39, fig. 28. Walker, John. National Gallery of Art, Washington. Rev. ed. New York, 1984: 219, no. 272, color repro., as by Sodoma. European Paintings: An Illustrated Catalogue. National Gallery of Art, Washington, 1985: 377, repro., as by Sodoma. Marani, Pietro C. Leonardo e i Leonardeschi a Brera. Florence, 1987: 120, 123. Brown, Jonathan, and Richard G. Mann. Spanish Paintings of the Fifteenth through Nineteenth Centuries. The Collections of the National Gallery of Art Systematic Catalogue. Washington, D.C., 1990: 129-133, color repro. 131. Gregori, Mina, ed. In the Light of Apollo: Italian Renaissance and Greece. 2 vols. Exh. cat. National Gallery and Alexandros Souzos Museum, Athens, 2003-2004: 1:332, as ascribed to Sodoma.